(Nanowerk News) In nanotechnology, mastering the machinery of chemical bonds is tricky business – and the fact that they are tiny, at the molecular level, is just one hurdle. Dartmouth researcher Ivan Aprahamian and his team have developed a new molecular switch that changes its configuration as a function of the pH of the environment. This discovery, using synthetic materials, mimics natural, biological molecular motors such as the F1-ATPase. This might someday help lead to targeted drug delivery systems, molecular-level data storage, and molecular electronics, important objectives in nanotechnology. The study appeared in December online issue of the Journal of the American Chemical Society. “The switching process takes place via a rotation around the carbon-nitrogen double bond, and it turns out that our system is the first chemically activated rotary switch that relies on rotation around a double bond as opposed to rotation around a single bond,” said Aprahamian, an assistant professor of chemistry, who explains that rotation around a single bond yields multiple conformations, whereas rotation around a double bond affords two configurations. “Light-induced configurational switches are known and have been used in various applications. Ours is chemically driven, similar to biological motors, which can lead to new possibilities in nanotechnology”. 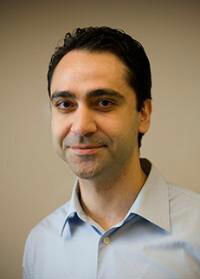 Aprahamian’s co-author on the paper is Shainaz Landge, a post-doctoral researcher at Dartmouth.